Size male: 17,6 - 22,1mm. Atelopus oxapampae - dorsal view. Atelopus oxapampae - ventral view. This species is endemic to the central parts of Peru, representing the first record for the genus in the Department of Pasco. 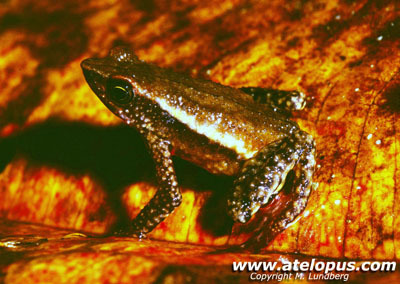 Atelopus oxapampae is known from three localities near Oxapampae between 1700 and 2200 meters asl. Listed as Endangered in view of an estimated extent of occurrence of less than 5,000 km², with all individuals in fewer than five locations, and a continuing decline in the extent and quality of its habitat in the Oxapampa area. The population trend is unknown but It is thought to be a rare species given that as it was recorded/collected in low numbers over a very long period. Last seen by Mikael Lundberg in 2003 as far as we know. If you have records from Atelopus oxapampae from a later date, please let us know. Habitat for Atelopus oxapampae, Peru. Atelopus oxapampae inhabits an area of cloud forests and secondary forests with some open areas that have been converted to grassland. Individuals have been found at night on leaves up to 1.5 m above the ground and in close proximity to a permanent creek, and in one instance close to a road. It is presumed to breed in streams. 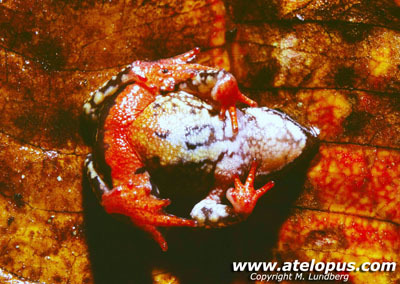 The type locality for Atelopus oxapampae is a narrow creek that crosses the road between Oxapampa and Yaupi. 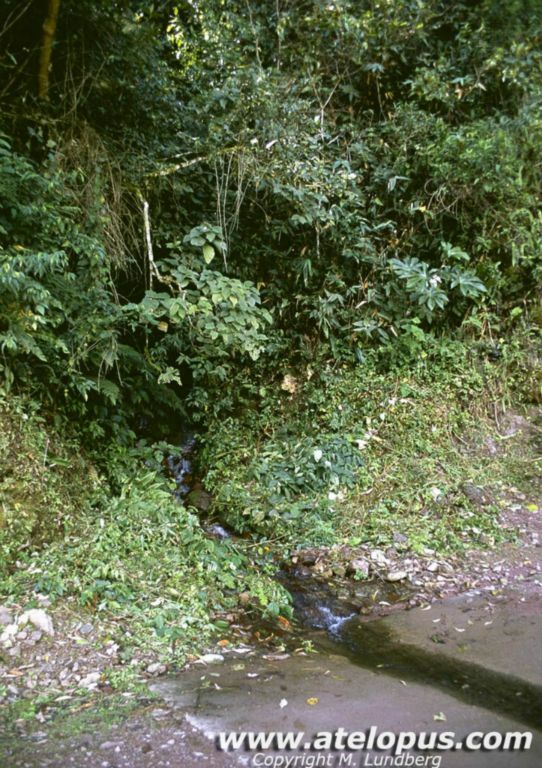 The creek is approximately half a meter wide and runs along the steep hillside, eventually it ends up in Río Paucartambo. 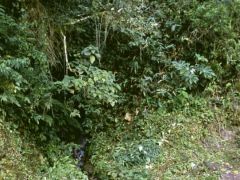 Typical dense cloud forest vegetation covers the creek and direct sunlight rarely reaches the ground. The animals that has been found was spotted on leaves at 10-30cm above the ground and less han half a meter distance from the creek. No female animals has been found/recorded, only males. The vegetation along the sides of the road close to the type locality is regularly cut down as part of road maintenance. The surroundings of Yanachaga-Chemillén National Park are intensively used for plantations eg. coffee or for cattle breeding leading to a lot of soil erosion. Chytrid fungus has so far not been recorded in this species, other species in this genus inhabiting montane environments have been affected by chytridiomycosis, so it cannot be ruled out as a potential threat. A new species of Atelopus (Anura: Bufonidae) from the Cordillera Oriental of Central Peru - Edgar Lehr, Stefan Lötters and Mikael Lundberg - PDF Here. Lehr, E. & Angulo, A. 2009. Atelopus oxapampae. The IUCN Red List of Threatened Species. Version 2015.2. <www.iucnredlist.org>. Atelopus oxapampae Photographs from Peru in 2003 by Mikael Lundberg.